How much money do you need to invest in equipment to become a professional photographer? As technology keeps developing, more and more high-quality and user-friendly cameras are released, which makes it easier for many people to take good photos. If you are skilled in using editing software, your photos can be above average, and if you are creative and talented, your photos can be even extraordinary. However, if you want to become a professional photographer, you will need more than talent and skills. In fact, you will need to be ready to invest certain amounts of money in your equipment which is notorious for being quite expensive. Of course, you don’t have to start off with the most expensive cameras and lenses. You should go step by step and gradually invest more as your income increases. At the beginning of your career, you should think about what kind of photography you want to choose and what your expectations are. Some types of photography are more profitable, such as wedding or fashion photography, so you could think about them if you need to get more money in a shorter period of time. It goes without saying that the first piece of equipment you must have if you want to be a professional photographer is a quality camera. 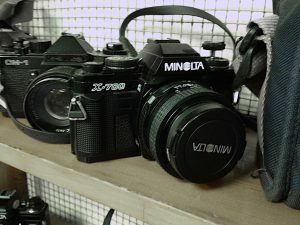 There is a wide range of cameras on the market, but you should know the difference between DSLR and mirrorless cameras. DSLR cameras are designed like the old 35mm film cameras. They are a bit larger, but their quality of autofocus and low-light shooting is much higher, which makes them great for shooting sports or wildlife. Mirrorless cameras, on the other hand, are more compact and better for making videos, but the choice of lenses is limited. 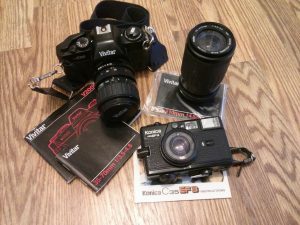 The prices of both types of cameras range from about 500 dollars for semi-pro cameras with one lens to around 3,000 dollars for amazing cameras such as the Nikon D850 or Sony Alpha A7R II. Although you may start off with a single-lens-reflex (SLR) camera, you should buy additional lenses if you want to be a serious professional. When choosing a lens, you must make sure that it is compatible with the camera body. The prices of standard zoom lenses and wide-angle zoom lenses range from 100 dollars to over 2,000 dollars. The former type is suitable for photographing various things, from landscapes to portraits, while the latter is ideal for panoramic photos of landscapes. Telephoto zoom lenses and prime lenses are much more expensive, from 150 dollars to 5,000 dollars. The former type is suitable for taking photos of sports or wildlife, while the latter is great for portraits and low-light environments. You will also need to invest some money in cleaning products and lens caps and pouches that provide protection for your lenses. Also, you may want to buy a teleconverter that increases the focal length, which can cost up to 1,200 dollars. Apart from bags and straps, there are certain additional pieces of equipment that a professional photographer must possess. One of them is a good tripod that will prevent any shaking of the camera, which costs from 10 dollars to a few hundreds. You will also need flashes and additional memory cards, which nowadays differ in speed, capacity, brands and prices. Moreover, you will need a suitable computer or a laptop with enough memory or additional external hard drives. You may need to invest more money in additional equipment than in the camera and lenses, but don’t be discouraged by the prices. Photography can bring you a lot of income, but you will need to think as a businessman, not only as an artist.